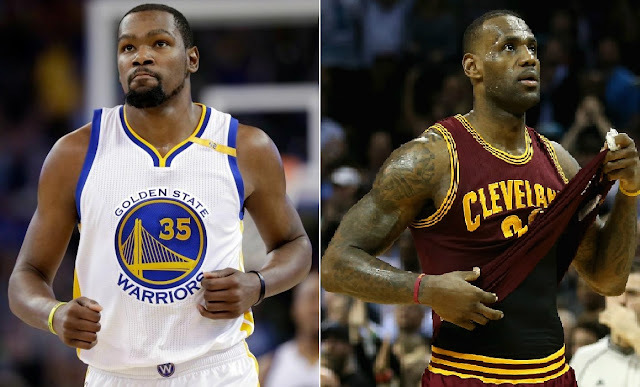 NBA Finals – The Golden State Warriors host the Defending Champion Cleveland Cavaliers in Game 1 of their best of seven series of the 2017 NBA Finals at Oracle Arena in Oakland. Both teams are in their third straight NBA Finals appearance and currently tied with 1 Championship each in their NBA Finals match up. The Warriors are the heavy favorite of winning Game 1 and perhaps the whole series? In fact, in Vegas the predictions are that the defending Champion has no chance of winning this year's NBA title over the super team GSW. In the 1st quarter, both teams are in tight contentions not allowing to pull away from one another it also leads to several lead changes that ends the 1st quarter 35 – 30 Warriors with 5 points. Kevin Durant lead the Warriors in the early quarter with 10 points while LeBron James off to a good start with 13 points. In the 2nd quarter, the Warriors start to pull away in the game establishing the first double digit of the game with under 4:53 to go in the quarter they completely dominated the Cavs in scoring especially inside the paint. Kevin Durant scores 13 points in the 2nd quarter to lead all scorers at the half with 23 points, 4 rebounds and 6 assist, Stephen Curry added 12 points and 6 assist. While the defending champion, manage to cut down the Warriors lead into single digit at the half, LeBron James leads the Cavs in scoring with 19 points, 11 rebounds, Kyrie Irving added 18 points and Kevin Love with 8 points and 13 rebounds. At the half Warriors up by 8 points 60 – 52. In the 3rd quarter, The Warriors are off to a good start, making a 13 – 0 run, establishing a 21 point lead 73 – 52 with under 8:06 to go in the quarter. Cavs starts the quarter slow finally made their first field goal of the quarter with 7:54 to go after a made 3’s by LeBron James. Cavs is slowly cutting the Warriors lead, but the Warriors are too much in the 3rd quarter, posting their largest lead of 24 points outscoring the Cavs in the 3rd quarter 33 – 20. In the 4th quarter, The Warriors are up by 21 points and the Cavaliers hasn’t found any answers of getting back in the game and with under 4:04 to go in the final quarter the Cavaliers bench finally replaces the Cavs starting five to show the white flag after failing to get back in the game. While the Warriors completed their dominance in Game 1, crushing the Cavs, led by Kevin Durant, who is clearly the best player and the big difference of Game 1, dropping 38 points. 8 rebounds and 8 assist while his counterpart LeBron James has 28 points, 15rebounds and 8 assist. As expected the Warriors win Game 1, 113 – 90. Game 2 is scheduled on Sunday June 4 (US TIME) at the Oracle Arena in Oakland. No Comment to " GSW Outclass the Cavaliers in Game 1 of the 2017 NBA Finals "